"There is one recipe which I hope you have eaten like me and can post the recipe. It is called ' voir ponda vuzo' up and down fire. 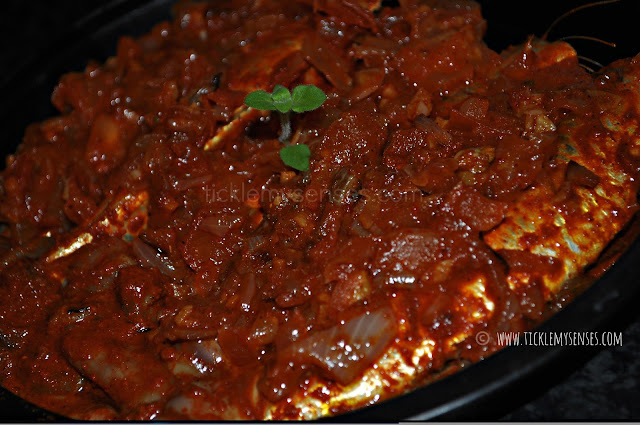 The dish is cooked traditionaly with fire on top and bottom and mackerals is cooked in a rich tomato garlic gravy. As I had half a dozen Sardines in hand I set out to prepare this dish. In the early 1900's leading to 1980's possesing an oven or gas supply in a Mangalorean kitchen was rare. So at the time most Grandma's when requested a baked dish would create their own little baking gizmos using what was available to them. They would pop the fish smeared with a delicious chilli mixture into a copper based vessel, then place the vessel over a 'ranni' in konkani for an earthen stove fuelled by firewood. Cover the pan tightly with a lid and place live charcoals on the top. This way the fish would cook from top and bottom, mimicking an oven. Brilliant isnt it!! 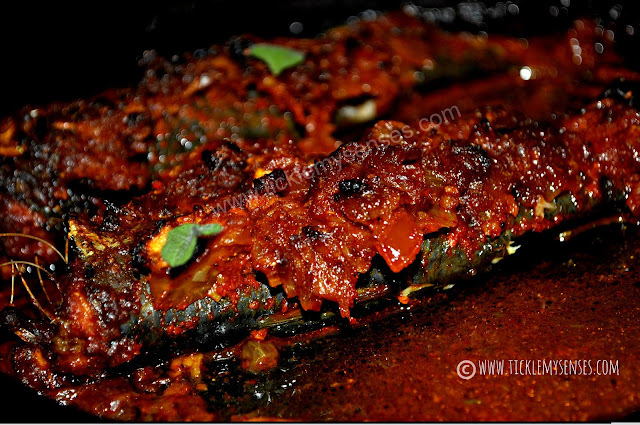 The smoky flavours imparted to the fish by cooking over firewood and using coals I believe is entirely out of this world!! There are many different ways that you can season your fish but I always find myself coming back to the ever so simple delicious Mangalore Meet Mirsang/Chilli paste which I have used in this recipe. The chilli keeps it hot, the vinegar/ lime keeps it zesty. Once you have smeared the marinade over the fish, you can let it marinate for a few minutes while you prepare the slicings for the fish to be laid on and covered with. 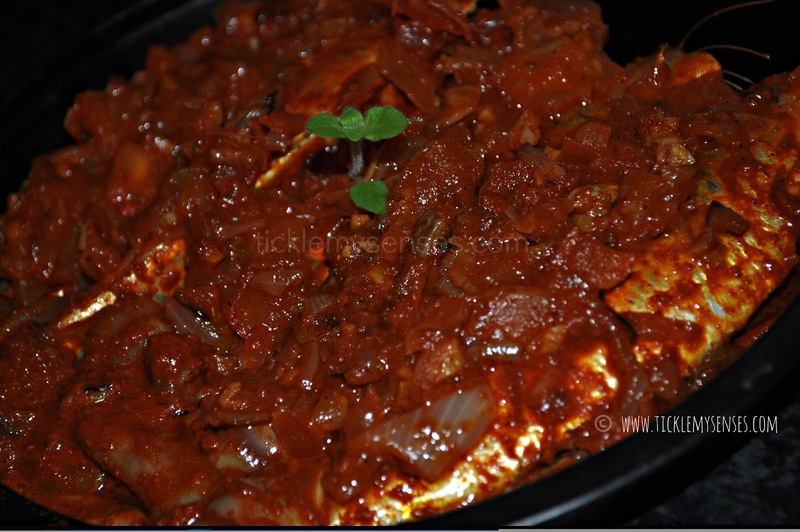 Simply place the marinaded fish in a oven safe dish cover it with the fried delicious onion, tomato, ginger garlic mixture, place in the oven for 20-30 minutes or till fish is cooked through and the spice paste appears nicely baked with a deep red colour and the edges of the fish and onions a bit caramelised. 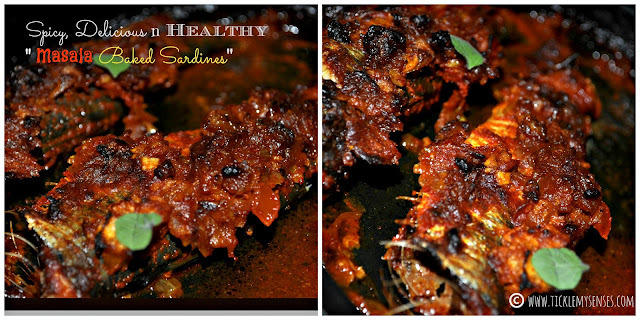 Although I love the traditional shallow fried sardines/ Mangalore Masala fried fish, this dish is a perfect alternative if you enjoy the spices and wish for a healthier and delicious alternative. I have tried this recipe with fish like Mackerals and Pomfret too....all with good results. Serve hot with steamed rice and a tasty Daaliso saar/lentil soup ( My mom's). 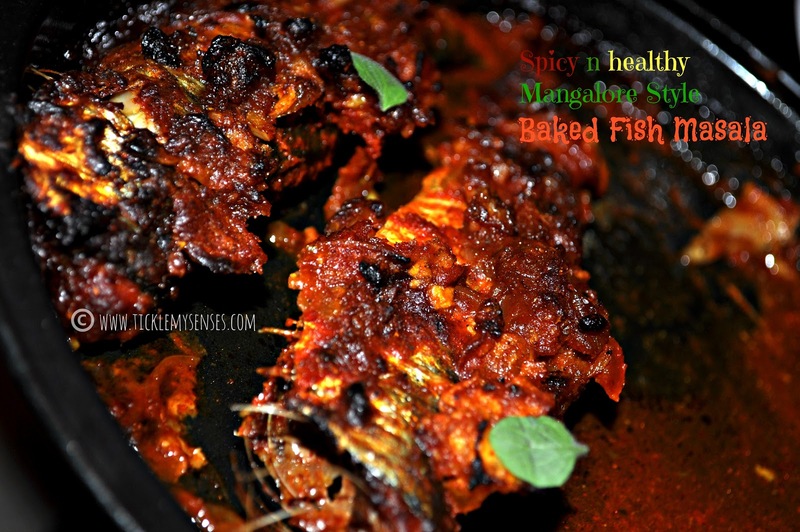 Recipe to Make Mangalore Style Baked Fish Masala. "Voir Ponda Vuzo"
Serves 2| Preparation time: 3o mins | Baking time: 20-25 minutes. Coconut Oil: 1 tbsp or as required. 1. Clean fish well. If using big fish like Mackerals or Pomfret try to clean fish without opening side. (Helps to stuff fish with the spicy tomato- onion-garlic mixture). Dry with paper towels. Keep aside. 2. Prepare Spice paste 1 : Take ingredients under Spice Paste 1 in a bowl, add water to make a shiny paste. See here. Do not make runny or too thick. Spread paste all over body and insides of fish. Keep aside for a minimum of 10 minutes. 3. Prepare the Slicings: Finely chop onions, tomatoes, ginger, garlic, green chillies and coriander leaves. 4. Prepare Spice Paste 2: In a small bowl take the powdered spices salt add vinegar, add a little water to make a thick paste. Taste for salt and sourness adjust. 5. In a pan take coconut oil, when hot add the curry leaves fry, add finely chopped onions and fry till onions are lightly brown, add the finely chopped ginger, garlic and green chillies fry till garlic slightly softens, add the prepared spice paste 2, and fry lightly ( do not allow to burn). Quickly add the finely chopped tomatoes and fry the mixture till tomatoes soften and oil starts seperating. Mash lighlty with the back of a spoon. Taste for seasoning. Adjust. 6. Preheat oven to 350 degrees. Lightly oil a shallow baking dish that will hold sardines/fish in a single layer. Place the 1/3rd of the prepared onion-tomato mixture at the base of a oven dish. Place fish side by side in prepared baking dish, laying fish on their sides over the spice bed. Stuff insides of fish with bit of mixture, place the remaining tomato mixture over the fish. 7. Place the dish in the center of a preheated oven at 180C/ 350F and bake for 20-25 mins or until done and top appears a deep red coloured. I would love to know how you got on with this dish or any of my recipes. Do drop me a line on my Facebook page or at carol@ticklemysenses.com. Look forward to hearing from you. Hats off to your cooking .... i am really in love with your food blog. Keep up the good work and post some more authentic fish receipes. Thankyou very much Oycie for your lovely word of appreciation.